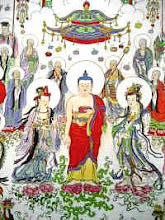 At that time the reduplicated bodies of Earth Store Bodhisattva assembled in the palace of the Trayastrimsa Heaven from a hundred thousand tens of thousands of millions of inconceivable, unutterable, immeasurable, ineffable, asamkhyeyas of worlds, from all the places where there are hells. Because of the spiritual power of the Thus Come One, each came from his own direction together with thousands of ten thousands of nayutas of those who had obtained liberation from the paths of karma. All came holding incense and flowers as offerings to the Buddha. 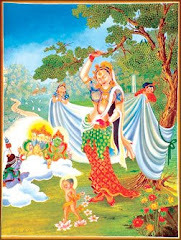 Because of the teachings of Earth Store Bodhisattva all of those who came were irreversible from Anuttarasamyaksambodhi, even though long kalpas ago they had been wandering in birth and death, undergoing suffering within Six Paths without even temporary respite. 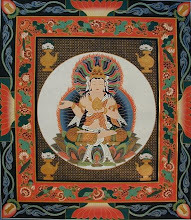 Because of Earth Store Bodhisattva’s great compassion and deep vows, however, each had borned testimony to the fruits. When they came to the Trayastrimsa Heaven, their hearts jumping, they gazed at the Thus Come One, their eyes not leaving him for a moment. Ten thousand miles of sky. The moon is reflected in as many pools of water as there are; if there are ten thousand pools, there are as many reflected moons. The moon in the pool represents the “spiritual” being discussed here. It is also “nature” and you might say a “thought” as well. Although there are the appearances of a thousand moons reflected in a thousand pools, the substance of the moon does not reduplicate. Likewise, the reduplicated bodies of Earth Store Bodhisattva created by living beings. By way of a simple analogy, the reduplicated bodies are like photographs. Originally, there is just one person, but an unlimited number of copies of his photograph may be made. The difference between photographs and reduplicated bodies is that the photographs do not have the ability to function, spiritual response, or the breath of life. 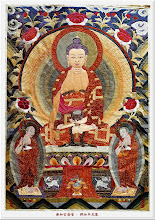 The reduplicated bodies of Earth Store Bodhisattva, on the other hand, are identical with his original body and are referred to as the “hundred thousand million transformation bodies.” Wherever Earth Store Bodhisattva sees a hell, no matter where in the world system of a billion worlds it may be, he dispatches a transformation body to teach living beings there. He does this in accord with his vow to teach all the living beings in the hells. The number of worlds from which the reduplicated bodies of Earth Store Bodhisattva returned to the Trayastrimsa Heaven is completely beyond calculation or comprehension, for the reduplicated bodies exist because of the needs of the limitless number of living beings who are flowing, floating and drowning, dying, and then being reborn again and again in the wheel of life and death, as many as waves on the sea. 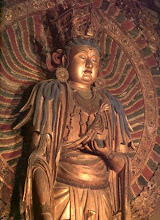 Because of Earth Store Bodhisattva’s great compassion and deep vows, many had borne testimony to the fruits of the path. 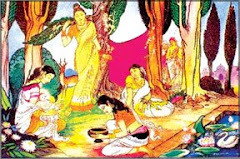 He vowed, “Only when the hells are emptied will I become a Buddha; only when living beings have all been saved, will I attain to Bodhi.” Their hearts jumping, they gazed at the Thus Come One, their eyes not leaving him for a moment. This is a sign of utmost sincerity. 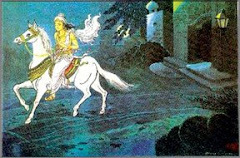 The World-Honored One rubbed the limitless crowns of the transformation bodies by means of his total psychic power, which enables one arm to become a hundred thousand, and said, “I teach and transform obstinate living beings within the evil world of the Five Turbidities.” Perhaps “obstinate living beings” includes you, perhaps someone else. Anyone who does not follow the teachings and continues to be unruly is obstinate. It particularly means Americans who very strongly dislike following rules. Just look at the situation here. As soon as children reach a certain age, they begin to ask why there have to be so many rules. Unruly adults come from children who do not like to follow rules. Subdued minds are harmonious and delight in receiving Dharma, neither opposing nor doubting it. “Keen roots” refers to those whose merit from past lives is extremely great, who are intelligent, and who have a great deal of wisdom. On hearing Dharma they accept it. There are also those who have reaped good retribution. In past lives they may have done deeds to plant the seeds which bear good fruit. Those who have been energetically exhorted to accomplishment have been exhorted more than once. If, for example, you decide to cross someone over and are not initially successful, keep trying. If they are far away, write letters explaining Buddhadharma to them, and if they are nearby, visit with them now and again and discuss Buddhism. Do not exhort others once or twice but many times. If you have not been effective, keep at it again and again, right up to the point where you become a Buddha. There are those who are dark and dull, that is, ignorant, who must be transformed for a long time in order to return. Long means not merely once or twice, not even three or four times. Here, however, it is simply a matter of an unfixed time. If I cannot cross you over in one day, then I will do it in two or three, in a month, a year, or even three, four, or five years. My resolve to cross you over will be a long-lasting one, so that eventually you will come to believe in the Buddha. 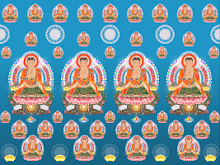 Sakyamuni Buddha reduplicates into many bodies in order to release all beings, each of whom has his own particular circumstances and his own karma. These transformation bodies are manifested in many forms, perhaps as a handsome man in order to cross a woman over, or perhaps as a beautiful woman to cross over men. He does this because he knows that, as a result of their heavy desires, most living beings like male-female relationships. Consequently, the Buddha is manifested in accordance with this basic nature of living beings in order that they may more easily be taught. The transformation bodies may be divine beings or dragons in order to cross over gods and dragons. They may be the imposing spiritual virtues of spirits, or the bodies of great ghost kings. Mountains, forests, streams, and springs are all manifestations of the Thus Come One’s Dharma body. We, along with all of San Francisco, are sitting in the Thus Come One’s Dharma-body but don’t know it. “Old Gold Mountain” (San Francisco) was manifested by the Buddha long ago in order to benefit the living beings who might live here. Although the text says mountains, forests, streams, and springs, don’t think that the level earth is not the Buddha’s Dharma-body, for it is. We are all a part of the Buddha’s Dharma-body, but we can’t see it, because we are like ants walking along the ground, unable to see the big picture. We are tiny bugs on the Dharma-body, we just don’t know it. A mountain may appear, for example, and as you climb it you may receive its spiritual energies and attain enlightenment. You may smell the fresh air of the Buddha’s Dharma-body while in the forest and become enlightened. You should not think that five hundred years after Buddha’s nirvana it became impossible to realize nirvana; it can be done even now. The only thing to be feared is that you will not work. If you do work, I will provide guaranteed insurance for you. When you have opened yourself to enlightenment, you will be able to collect on the policy. Of course, once you have become enlightened, you will not want to bother collecting the money, and so I’ll still come out ahead on the deal. 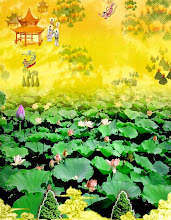 You may be bathing in a river and feel very comfortable, after which you attain enlightenment; the river is just a manifestation of Sakyamuni Buddha. The water from wells is similar: you may drink it, and day by day your resolve for the Way increases. All of these are inconceivable events. 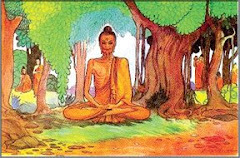 In general, every move of the Buddha’s is undertaken for the benefit of living beings. While you sit in meditation Sakyamuni Buddha may be manifested in the body of a heavenly emperor who bows to you and tells you that he is lord of the heavens. He comes to you and tells you that he is lord of the heavens. He comes to encourage you because you have firmly resolved to attain the Way. A wise wheel-turning king has many kinds of precious treasures, among which is a flying chariot pulled by a horse faster than a rocket. Our rockets, which can go to the moon, require quite some time to get there. The flying chariot of the wheel-turning king, however, can go everywhere within the world system of a million worlds within an hour – not merely to the moon and nearby planets but to other galaxies. A wheel-turning king also has a treasure storehouse; whenever he needs money he just states the amount and the earth opens up, revealing as much as he requires. Because his blessings are so great, all the wealth of the earth is at his disposition. Among his treasures are women. Whenever wise wheel-turning kings wish for a woman, one appears spontaneously. Everything accords with the will of such a king, and he is not subject to the suffering of denial of his desires. The Buddha may be manifested in such a wheel-turning king, and when living beings see him, they resolve their thoughts on the Way. Aside from wheel-turning kings, one never knows which of you laymen might be a manifestation of the Buddha. 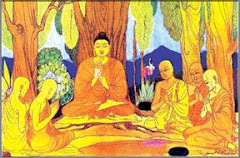 Bhiksus, bhiksunis, upasakas, upasikas: Sakyamuni is manifested in many bodies other than his own Buddha-body in order to cross over living beings. You should contemplate accumulated kalpas, a period so long that it cannot be known. Throughout this time Sakyamuni Buddha will energetically undergo suffering, without a moment for laziness, happiness, or pleasure, in order to release and cross over living beings. Do not think, “Oh, well, I’m probably not included.” You are certainly included among living beings who are obstinate and difficult to transform. How much of his heart’s blood has Sakyamuni Buddha expended to transform and teach us, and yet we still do not know a sense of shame. We think that everything is just fine and that there is no problem. 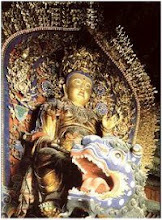 “It’s not so important,” we say, “if Sakyamuni Buddha has to suffer a bit more, it’s no matter. I don’t have to study Buddhadharma now because it will not matter if I fool around for a while.” You explain principles for yourself in this way, and act as your own defense lawyer. 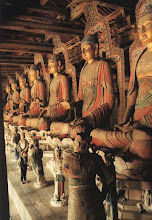 Although Earth Store Bodhisattva’s one body reduplicates to become many bodies, the many return together and become one. The many bodies are just one and the one is many. To speak of this in greater depth, there are neither many bodies nor one body; Earth Store Bodhisattva basically has no body at all. How can we say this? It is because he has no thought of a self. Although he has many bodies, they are not many, and although he has one body, it is not one. One is many, many is one. 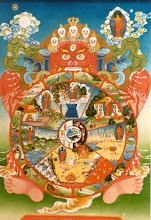 Earth Store Bodhisattva reduplicates into many bodies, which then all return to one. Which of all these bodies is Earth Store Bodhisattva? Which one is not? Would you say that any particular one of these bodies is his? You cold say that, and one of them is. Yet you could say that it is not. You could say that any body he manifests is his body. According to this theory, however, you could say that there is fundamentally no appearance at all, and therefore you could say that these are not his reduplicated bodies. You could also say that any person who vows to study the conduct Earth Store Bodhisattva is his reduplicated body and is no different from him. People wish to study his conduct because they respect his behavior, his wisdom, and his vows. 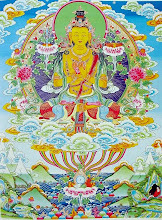 In fact, you are one of Earth Store Bodhisattva’s reduplicated bodies, and that is why you like him. Act in accord with his resolve and vows and you are his transformation body. If you can cultivate in accord with the Buddhadharma, if you have a self-nature which is replete with blessings and wisdom, if you understand the mind and see its nature, you too will have spiritual powers and will be able to return to Earth Store Bodhisattva. Return together to a single form means to return to the origin, to go back to the source. Earth Store Bodhisattva wept with pity for four reasons. First, the living beings in the Six Paths commit bad karma and do not change their behavior. They continue to commit offenses in the realms of the hells, hungry ghosts, animals, humans, asuras, and gods, and still know no sense of shame. Second, living beings are stubborn and difficult to teach. If you explain the Buddhadharma, they often do not listen, but if you talk non-Dharma with them, they enjoy it. If, for example, you praise someone, talk about how learned and well-behaved he is, people will not pay much attention. If, on the other hand, you speak ill of others, they will listen avidly. 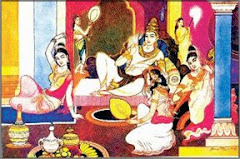 “Why, did you know, so and so is so clever that he does scores of things you’ll never find out about.” Yes, people will pay a great deal of attention to this sort of tale, but they will not listen when you tell them to study the Buddhadharma. If you tell them about a mysterious drug that brings about wonderful and mystical changes, they want to give it a try. Many take marijuana and LSD and other confusing drugs because they are looking for these changes. They become confused and muddled yet feel that they have ended up in the Land of Ultimate Bliss. Although these states are basically harmful, those who experience them feel that everything has been transformed – not even heaven and earth are as great as they. When their drug experience is over, however, they are exhausted and have headaches and general bodily pain. Sometimes they do not want to work but just lie about like corpses, unawake and unreasoning. They never wonder how they have come to such a state but only think that if they take a little more dope, they will become enlightened. And so they continue to violate laws and deal in drugs. Wouldn’t you say that this is an ultimate form of self-destruction? Third, the Thus come One was about to enter nirvana, the sun of wisdom was about to set, and Earth Store Bodhisattva was sorrowful. 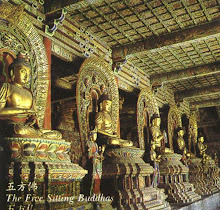 Fourth, in the palace of the Trayastrimsa Heaven, Sakyamuni Buddha instructed Earth Store Bodhisattva to work until Maitreya appeared in the world, crossing over living beings so that they might encounter Buddhas and receive predictions of enlightenment. Earth Store Bodhisattva wept as he was given this extremely important responsibility. Spiritual powers are wonderful and unfathomable; there is no way that these powers can be known. Yet, if you wish to cross living beings over, you must have these powers. Spiritual power, moreover, is not sufficient in itself; you must also have great wisdom. Wisdom and spiritual powers aid one another. 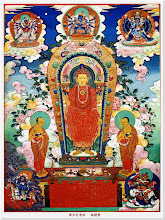 To obtain them we should first take refuge with the Triple Jewel because before this we are outside the Buddhadharma. Taking refuge is called “casting off the improper and returning to the proper, leaving the dark and entering the light.” Therefore one takes refuge with the Buddha, Dharma, and Sangha. To reach the bliss of nirvana, which has the Four Qualities of permanence, bliss, self, and purity, one must have done good deeds. A hair represents the lightest of good deeds; a drop represents the fewest; a grain of sand represents the minutest of good deeds; and a mote of dust represents the smallest. A hair is extremely light, a drop of water is a very small quantity, the most minuscule particle of sand is a grain, and a mote of dust borders on emptiness – that is to say, one-seventh the size of the smallest particle visible to the naked eye. This is where the work begins. Great benefit refers to becoming a Buddha. Just look how great this benefit is. Earth Store Bodhisattva, with his great wisdom, uses all kinds of inconceivable and wonderful methods, so that even if you want to avoid receiving his teaching, you cannot do so. This is what is meant by the phrase from Confucius, “wishing to stop and yet unable.” You might say that you are going to stop studying the Buddhadharma, but you have no way to actually do so. Ah, the wonder is just this very point. Who makes you this way? 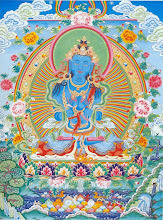 It is simply through the wonderful functioning of that good, knowing adviser, Earth Store Bodhisattva, of great vows. He spoke these words three times to show the importance of the matter under discussion. Laws, for example, are passed in this way; after they are read three times, with no objections, they are considered passed. In this case, however, it is not a question of passing or not passing but merely a matter of showing the importance of the statement. On hearing this, wouldn’t you say that we ought to be happy? We have committed so many offenses, and yet we still have the opportunity to become Buddhas. Ah, how high, how deep is this kindness. So it is said, “Look up, there is none loftier; drill in, and there is none more firm.” This Bodhisattva’s state is truly inconceivable. On hearing Earth Store Bodhisattva’s guarantee that all beings would accomplish the Way, the Buddha was pleased and said, “Very good, very good.” The Bodhisattva spoke to the Buddha three times, and now the Buddha replies twice for the same reason. There are basically Four Great Vows: I vow to save living beings in unending hell; I vow to cut off interminable afflictions; I vow to find unlimited Dharma “doors”; I vow to perfect the unsurpassed Buddha Way. Now that these vows have been put into English, you should ask yourself every day, “Have I saved living beings, or have I been crossed over by them? Did I start out believing in the Buddha and then, after being told by someone else of the glory of Jesus’ crucifixion, become a Christian?” If this is the case, then you have been crossed over by others and have not saved them. The same investigation should be made for the other three vows. “I vow to eliminate interminable afflictions. Is it true that when someone spoke harshly to me I got angry and raged in ignorance? If this is the case, then just what have I eliminated?” If you find that you have not been afflicted, you still can’t claim to have attained anything. Wait for an opportunity that tests you, and see if you have really rid yourself of all your afflictions. 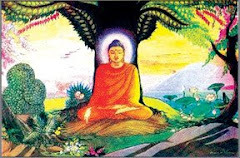 If you have not done so, you have only studied the Buddhadharma superficially; but if you have eliminated them, you have obtained inner peace and entered into the sea of Buddhadharma. “I vow to learn the unlimited Dharma Doors.” The doors and entrances into the Buddhadharma are unlimited. It is said there are eighty-four thousand of them, but how could the doors of the Buddhadharma stop at eighty-four thousand? There are far, far more than that. Don’t simply think, “I have now learned to recite the Surangama Mantra and that is fine enough.” Take a look at the Tripitaka, vast as the sea. If you have obtained only a hair, a drop, a grain of sand, or a dust-mote’s worth, you cannot say that you have understood Buddhadharma. If you really penetrate the Buddhadharma and are able to drink the great sea dry in a single gulp, then you have understood. If you cannot do this, you must study more. “I vow to perfect the unsurpassed Buddha Way.” This does not need further certification. If you had accomplished Buddhahood, we would not have any questions, for they would all be resolved. Of course, if you have not become a Buddha, you cannot pretend to be one, as some people do, and say, “Not only am I a Buddha, so are you. Everyone is Buddha.” Just what kind of a Buddha are you? A greedy Buddha? A hateful Buddha? An ignorant Buddha? An afflicted Buddha? Do not follow arrogant frauds who say they are Buddhas when they are not, who say they are enlightened when they are. The time when Earth Store Bodhisattva will testify to Bodhi will be at the extreme limit of the future. Is it then the case that he will never have an opportunity to accomplish Bodhi? Don’t worry about that. 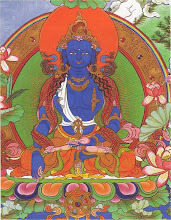 Earth Store Bodhisattva accomplished Bodhi long, long ago. If he had not done so, he would not have such inconceivably great spiritual power and wisdom. He is just waiting for you and me to accomplish it as well. For these reasons we should all be courageous and vigorous in working toward Bodhi, toward enlightenment.